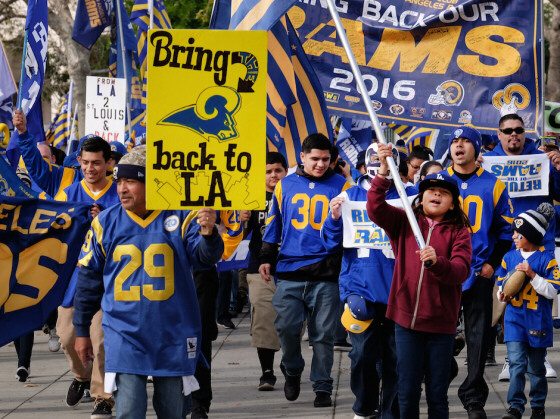 The NFL owners voted 30-2 on Tuesday, January 12th for relocation of the St. Louis Rams back to Los Angeles where they were until 1994 (the last time L.A. had a professional football team) along with the option for the Chargers to move there as well. There is a lot of excitement with a team coming back to the major media market that is L.A., but what are the positives and negatives of this move. The main positive is the move itself that now puts a team back in the second largest city in the United States. Teams in larger markets do well in any sport, and especially the National Football League. If a city like Green Bay can support a football team with the success it does, certainly tinsel town can too. The Rams were also originally from Los Angeles as well. While in L.A., the Rams enjoyed some success especially in the 1980s and had great players such as Eric Dickerson and Deacon Jones. Another positive is that a new stadium will be in the works in Inglewood. With a new stadium being built, the Super Bowl being held in Los Angeles will be right behind. The last Super Bowl held in Los Angeles was at the Rose Bowl Stadium in 1993 when the Dallas Cowboys defeated the Buffalo Bills 52-17. Los Angeles has hosted seven Super Bowls including the first and hosted one about every four years. Once the new stadium for the Vikings in complete, they will be hosting a Super Bowl, and Detroit was host after the completion of Ford Field. The NFL loves to show off their new stadiums in the Super Bowl, and the location in L.A. should mean a lot in that location for years to come. The negatives start with the team that is moving to Los Angeles. While the Rams had played there before, that was over 20 years ago. I have to wonder if the sentiment for this team is still there after such a long period of time. The Rams had also moved themselves to Anaheim prior to departing Southern California completely. The Rams are also not the best team in the league either. The Rams have not made the playoffs in over a decade and despite a good effort to finish the year .500 this season, there are questions as to whether or not Jeff Fisher will return. Now a new coach may be exactly what this team needs to take the next step, but a new coach could just as easily mean rebuilding for a few years too. Just as the stadium is a positive, it is also a negative. The new “City of Champions Stadium” is not set to be open until the 2019 season, which is three years away. In the meantime, the Rams will be playing at the Los Angeles Coliseum which they will share with the Trojans of the University of Southern California and the Chargers if they decide to move. The Coliseum is a very historical building, and it is always a good thing to have such living monuments. However, all that history is because the stadium is that old. It was opened in 1923 and does not have close to any of the amenities of modern stadiums, especially with the rate of new ones being built since 1994. At the end of the day, it has been too long for a team not to be in Hollywood, and this is a good day for the National Football League. The situation with the stadium will be forgotten once the new one is built, and a winning team will really make this move pay dividends in the end.